The Total Wreck Mine in the Empire Mountains of southern Arizona was discovered in 1879. Before development could occur a water source had to be located. There were no springs in the vicinity of the mineral discovery to provide the water needed by a mining operation. 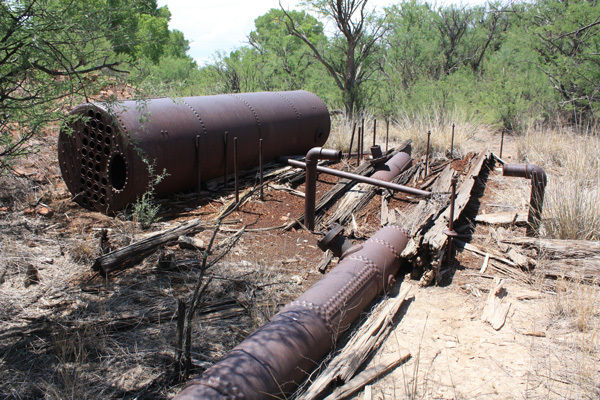 After a period of negotiations, property was purchased on Cienega Creek, several miles east of the mine, and a pump and waterline were installed. 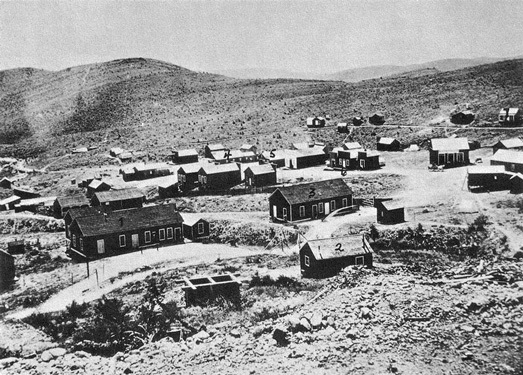 This website, Wyatt Earp Explorers, includes a brief statement about the water delivery system: "A powerfully geared pump was installed there, and a six inch iron pipe laid to the top of a small hill just east of the camp. Two 50,000 gallon redwood tanks were built there, and a four-inch pipe line ran through the little town to the mill and furnished plenty of water". 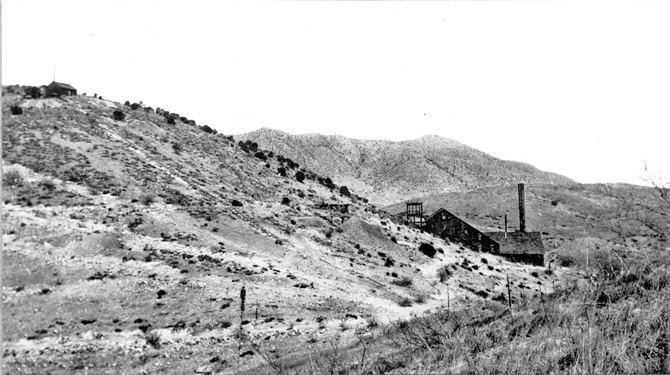 In 1880, or thereabouts, a 70 ton mill was constructed on the mine property. Shafts were sunk and ore was shipped. A thriving community soon followed. I have not been able to find out much about the mill at the Total Wreck Mine other than its main feature was a bank of twenty 950 pound stamps. In reading about the operation of other stamp mills, I understand that it was not unusual to need 1000 gallons of water for every ton of ore to be concentrated. If that were the case at the Total Wreck, then quite a bit of water was required and was apparently supplied by the pumpsite down on the creek! My interest in looking for the old pump station came about when I mentioned to a friend that I had recently been back to the old mine. He asked whether I remembered us having been to the pump site many years ago. His recollection was that there were several old boilers and other relics. I could not recall the trip or the place. And unfortunately, he did not remember the pump's location. But we got lucky. 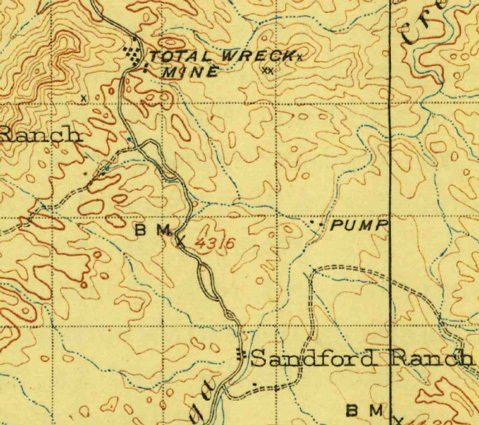 I found a copy of a 1905 topo map of the area and the mine and pump site were identified on the map. Two building structures were shown at the pump's location. We used more modern topo maps to try to zero in on the pump's location. Another friend and I recently drove into the area using primitive Las Cienegas National Conservation Area roads. We then hiked a short distance to where we thought the pump was located. The creek bank that we were looking for turned out to be very tall and was grown over with very large mesquite trees. Once we got up onto the bank it was slow going as we picked our way through the growth. The ruins of a multi-room adobe structure were the first man-made structure that we found. And then after some more time spent wandering through the trees, the remains of one old steam boiler and then another presented themselves. The site is not pristine. The boilers have tumbled down or been pulled down.Tubes have been removed from the boilers. There are no signs of a pump or the engine that may have turned it. And I am not sure of the location of the well. How the bricks and rocks that were imported to the site were used were difficult to understand. Three-drum boilers were used at this site. I do not believe that I have ever seen that arrangement before. At least ones that have been so exposed to view. My understanding is that the third drum, called a "mud drum", was used when the water was silty or clayey. The sediment settled in that drum and was periodically cleaned out. Near the second boiler are several large timbers and several pieces of 4" pipe. I did not see any 6" pipe. I think that this area may have been the near the site of the pump. There is also a heavily riveted tube, sealed on both ends, that I have no idea how it was used. This is the first site that I can recall in which all of the nails scattered around were square shank! A few hundred feet away from the boiler site are the ruins of a multi-room adobe building. If this building was associated with the pump, then I am guessing that this was where the operators lived. I was not able to locate any pipeline away from the pumpsite. A walk quite a ways up the canyon did not show any evidence of its existence. Cienega Creek, today, is part of a BLM Conservation area. It is surprisingly open, even to ATV's. The ecology is very different from the Sonoran Desert environment more common in southern Arizona.